Tonight Carly out did herself as debate monitor and stop watch queen. She made sure she reported how many minutes were spent on each topic before giving her “teeth whistling” answers. Was anyone else getting annoyed at the lip whistles with every other word? The microphone magnification certainly didn’t help. I was putting my hands over my ears half the time. Carly came across a bit angry at times, and definitely did her share of jumping in and not shutting up when told her time was up. (But, neither did most of the others). 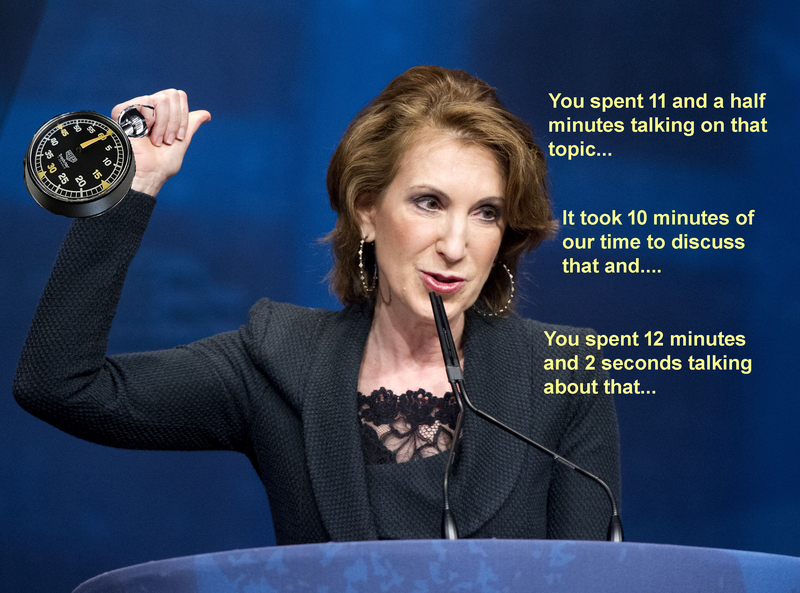 All in all, Carly needs to pursue a field that allows her to use her stop watch and time things. Like a race, just not the one to the White House. On your mark, get set, GO! Bye- Bye Fiorina. Heey very nice site!! Man .. Excellent .. Wonderful .. I will bookmark your blog and take the fedds additionally? F*ckin’ amazing things here. I am very glad to look your post.